Here’s a behind-the-scenes look at the Southern Ontario Sommelier Alliance as well as how the competition was organized and the scoring system. I must say that I was impressed with the level of professionalism and thorough evaluation of the wines involved. Read the results of the wine competition here. I look forward to more great initiatives from this group that will support the Ontario wine industry. What would you like to see this group do? SOSA is, the Southern Ontario Sommelier Alliance. We are a group of Certified Sommeliers, educated in Ontario, certified by both the Canadian Association of Professional Sommeliers (CAPS) and the Court of Master Sommeliers (CMS), who formed an alliance which would serve as a “tasting group” for those of us who wished to meet regularly and keep our deductive tasting skills sharp. As well, SOSA exists as a social group for; sommeliers, students currently studying to become certified “somms”, and also anyone who has a passion for wine and expanding their palate. Last August 19th, 12 sommeliers sat down to judge, in blind fashion, over 130 wine submissions from all over Ontario. As well, another 20 sommeliers reviewed these wines, all in an effort to award one entrant the SOSA CUP. The unique slant this competition has over all others is, simply, everyone in attendance, everyone judging these wines is a sommelier. This, our inaugural Wine Review and Competition, was born from the idea that the people best suited to evaluating Ontario wines would be a group of regimented Ontario wine professionals, all familiar with the pertinent criteria necessary to evaluate wines from a purely unbiased standpoint. This competition serves as a way to connect Ontario winemakers directly to the top sommeliers in Ontario working at the best fine dining establishments in Toronto and the outlying regions of the G.T.A. What we hope we’ve accomplished is a means to showcase, and present some of the best wines in Ontario directly to the most influential creators of fine dining wine-lists. Niagara, for Ontarians, is (if I may) our Napa Valley. Niagara is this beautiful, bountiful fruit basket of Ontario where some very interesting wines are being made group of talented winemakers. But for the average wine drinker, Ontario wines are not taken as seriously as wines from other well established parts of the (wine) world. And for (perceived) wine snobs, Ontario is mostly not even on their radar. Why is this? It is due to a lack of study, and context. As trained sommeliers, SOSA members are educated in evaluating wines not just from the impact of flavours on the senses, but by structural analysis. The relevant thing bout having a group of sommeliers critiquing wines is simply that we are, literally, “the working man’s palate”. We have all been trained, in the same manner, to see wines from a practical standpoint. The only wines a sommelier favours are those that will suit a wine-list, stand on their own or be a great food partner, and will be economically feasible. There are no “scores” on a fine dining wine-list – only great wines. Usually, when one comes across a wine review, the reviewer is generally more concerned with listing flavour descriptors and appropriate food matches to his/her audience, and then attaching a “score” to the review. The emphasis here is on the wines (so we are not including the scores!). Does anyone ever ask where this score came from? What criterion was involved in the judgement process? Usually we are left with a mystery on our hands. In this report we will be including our “scoring matrix”, put together with the guiding hand of Master Sommelier Bruce Wallner, in order to reveal the process behind the final number. It would be nice, if we all, as evaluators, used the same (consistent) process to score wines. The idea of having SOSA conduct this review and competition is to uncover those gems that exist in this province, perhaps not on the L.C.B.O. shelves, but directly from some of the best wineries of which perhaps you may not have heard. We as wine consumers, not unlike wine makers, have to make a conscious decision: Do I look for authentic typicity from an international varietal? Or do I look for a uniqueness that only local terroir could bring to an internationally planted varietal? This is a great dilemma. We as worldwide imbibers have been afforded the opportunity to drink Cabernet Sauvignon from Bordeaux, Riesling from Germany, Cabernet Franc from the Loire, Zinfandel from California, but is this what we should expect from those varietals when grown in Ontario? This is where the “purists” duke it out with the “pioneers”. And this is precisely where an impartial palate comes in to play. Even though Ontario is not Burgundy, Champagne, the Rhone, the Loire, or Mosel – we found some very, very good wines that not only bring to mind these geographic name-sakes, but do justice to these grapes given the latitude and climate we possess here in Ontario. SOSA constructed a scoring matrix that would take into account all the criteria necessary to address the structural elements of a wine, as well as the typicity of the grape. What was also added to this scoring matrix was a component that accounted for 10% of the overall mark which addresses, simply, the enjoyment of the wine. 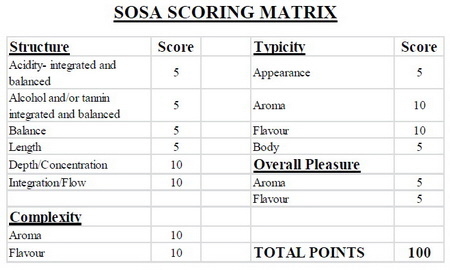 With the SOSA matrix it was possible for a wine to score fairly well, even if it was not strong on typicity. As an example, we experienced some wines that lacked the typicity of the grape on the label, yet scored well due to its structural elements, and overall enjoyment. The one caveat for scoring Ontario wines is to take into account the fact that we do not possess the history of Europe. In Ontario, we only have roughly 20 years of history to be able to fall back on. Thumbing through the SOSA rolodex of roughly 60 Southern Ontario sommeliers, we were able to acquire 12 of the most influential wine professionals to preside over the more than 130 wines submitted to the inaugural SOSA Wine Review and Competition. We felt that if one wine reviewer’s opinion was good, 12 must be far more reliable! 1) Bruce Wallner, M.S. : Bruce is one of only three Master Sommeliers in Canada, of which there are only 197 worldwide! Bruce has worked everywhere from Hotel du Vin in London, to Australia, and now Toronto. Currently Mr. Wallner serves as Chef Sommelier at Mideastro in Yorkville. 2) Will Predhomme: Will, an Advanced Sommelier, a previous winner of B.O.S.C. (Best Ontario Sommelier Competition), and recently placing 6th in Brazil at the Association de la Sommellerie International Americas division, runs the wine program at Canoe, 54 stories above the city of Toronto. 3) Corey Ladouceur: Corey, an Advanced Sommelier, has run wine programs for the Spoke Club, Hockley Valley Resort and George restaurant. 4) Johnathan Gonsenhauser: an Advanced Sommelier, Johnathan has been a fixture at E11EVEN (part of the MLSE) for several years. 5) Jasmine Black: Jasmine, a Certified Sommelier, currently runs the wine program for REDS bistro. 6) Sara d’Amato: Sara is a Certified Sommelier, board-member of the Canadian Association of Professional Sommeliers, wine columnist and blogger, and champion of Ontario wines. 7) Drew Walker: Drew, a Certified Sommelier, currently runs the wine program at the newly completed Four Seasons in Yorkville. 8) James Oatway: James, a Certified Sommelier, is a board-member of the Canadian Association of Professional Sommeliers, the President of the Southern Ontario Sommelier Alliance, and currently works for the wine agency, Halpern Enterprises. 9) Adam Kern: Adam is a Certified Sommelier, and a wine maker currently residing in Prince Edward County making wines for Keint He winery. 10) Ludovic Garnier: Ludo, a Certified Sommelier, runs the wine program at The Spoke Club here in Toronto. 11) Matthew Roulston: Matthew Roulston is a Certified Sommelier currently running the wine program at LA’s (aka Little Anthony’s), in the heart of downtown Toronto. 12) Drew Innes: Drew, a Certified Sommelier, has been an outspoken and impassioned instructor at George Brown College, teaching introductory wine courses to the masses for years. Out of over 130 wines sampled last August 19th, SOSA chose one winner among all entries, as well as four category winners. We would also like to point out the 20 Best Red and White wine entries, all well within one or two points of each other, as well as the winners of the Best Rosé and Best Sparkling Wine categories. The wines submitted to our review and competition came from Price Edward County, Lake Erie North Shore, and of course the Niagara Peninsula. We were happy to find that each region has begun to reveal its specific strengths. With this being our inaugural competition we received entries that could only be described as “apples and oranges”. We did not specify price categories or current vintage as guidelines for submission. We received vintages that ranging from 2007 (perhaps many people’s best efforts) to 2011, the most current efforts of some wineries. SOSA decided that for this year only we would allow any submissions, allowing current vintages to go back to back with wines that have had time to settle down or gain nuance. We felt that for SOSA’s first Wine Review and Competition we would accept the best wines that Ontario wine makers could come up with. Price was not an issue either. The wines were judged blind, side by side, whether it be a $12.00 wine or a $55.00 effort- the wines were judged by (varietal) alone. In the end, the inexpensive beat out many entries priced much higher! Special Thanks to: Mark William’s and “Hip Restaurants”, The Cheese Boutique, Adam Hijazi, Delaire Dhillon, Michelle Paris, Sean Rowlands, Jeff Neudorf, Adam Kern, Kristen Allen, Candida Ness, and Dennis Grimm. The Southern Ontario Sommelier Alliance will be holding the 2nd annual Ontario Wine Review and Competition next summer. This competition is open to all Ontario wineries. See you next year!